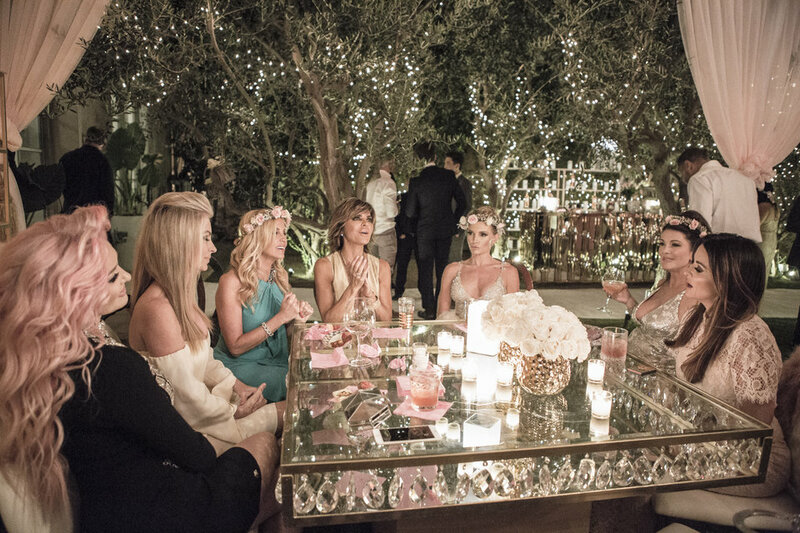 The Real Housewives of Beverly Hills are known for their over the top parties, and who couldn't be inspired by Lisa Vanderpump's diamonds and rosé party. BUT, did you know you can get this look for your wedding or event in Nashville. You can be as fabulous as Lisa Vanderpump and throw your own diamonds and rosé themed event. ...the party you were greeted with flower crowns and of course a glass of rosé. The beginning of your event starts with the arrival and sets the tone for the entire evening. Greeting guests with a glass of rosé or your favorite cocktail sets the mood for a fun time. Providing your guests with a flower crown isn't necessary, but offers a since of whimsy and excitement for what's to come next. One of the most gorgeous items at this party was the stunning chandelier tables. Can you believe you can rent these here in Nashville? Look no further then Visual Elements for these fabulous tables. The gorgeous draping and lighting in the tent set the mood perfectly and transformed a dingy tent into a pink rosé dream. Nashville Audio Visual and Nashville Event Draping can create this rosé tinted tent dripping with diamond chandeliers down the center. And last, but not least, the tall crystal centerpieces topped with flowers and candles. Phillip Suits with PS Designs carries these gorgeous candelabras and can create a floral center piece built for a queen.